The long, lingering notes of a solitary bagpiper filled the inner yard of Fort George before being joined by the sound of drums and marching feet. The music signalled the start of the 78th Highlander regiment’s daily muster parade. Allison Overbeeke’s Grade 8 class, from Lethbridge Christian School, Alberta, watched as historical reenactors conducted marching drills. On the fourth day of Canada’s Coolest School Trip, the students were treated to an exciting immersive experience. At the Halifax Citadel National Historic Site, they learned about the history of the fortress and even got a taste of 19th century garrison life. The annual Canada's Coolest School Trip contest, hosted by Canadian Geographic Education in partnership with Parks Canada, Historica Canada and the Canadian Wildlife Federation, asks Grade 8/Secondaire 2 students to create and promote a one-minute video about a Canadian national park and its natural or cultural significance. This year, the Lethbridge students won an all-expenses-paid trip to Nova Scotia with their entry about Waterton Lakes National Park. On their way to Halifax from Kejimkujik National Park, the class made a short stop at Peggy's Cove, home to one of Canada’s most famous lighthouses. Built in 1915, Peggy’s Point lighthouse sits on smooth white rocks overlooking the ocean. The surrounding rustic village, with its piles of lobster traps and colourful boats bobbing in the bay, is still an active fishing community to this day. After gazing out at the surging waves of the Atlantic Ocean, the students piled back on the bus. They arrived at the Halifax Citadel just in time for lunch and the firing of the noon gun by the Royal Artillery, a long-standing Halifax tradition. Lunch was set out on tables covered with Mackenzie tartan table runners, honouring Francis Humberston Mackenzie, who founded the 78th Highlander regiment in 1793. The 78th Highlanders wore the same uniform no matter the weather; to get a feel for what it was like to be a soldier in the 1800s, the students had the opportunity to dress up in period clothes. They received some brief military training as they stood at attention in their green and blue tartan kilts. In the afternoon, an interpreter led the students around the Citadel, relating its history as they walked. They learned about the artillery reserves and the tall masts set up on one side of the fort, which were used to communicate messages to other forts and to ships waiting to enter Halifax Harbour below the steep hill. The students also walked through a replica First World War trench, and learned about the fort's role in more recent military conflicts. After dinner, the class split into two groups and held a contest to see which group could properly hoist a flag in the least amount of time. With sunset approaching, the historical artillery reenactors rolled a cannon up to edge of the fort and loaded it with black gunpowder as the students covered their ears in anticipation. A pause, and then one deafening shot rang out. As it grew dark, the students were given lanterns and followed a guide on a ghost walk of the Citadel. In the gathering dusk, the guide recounted the story of the Grey Lady, who is said to lurk around the former barracks. She was the bride-to-be of a married British soldier, who committed suicide to avoid the shame and scandal. With these spooky stories in mind, the students turned in for the night. On the final day of Canada's Coolest School Trip, the students got up early to squeeze in a few more activities around Halifax before returning home to Alberta. 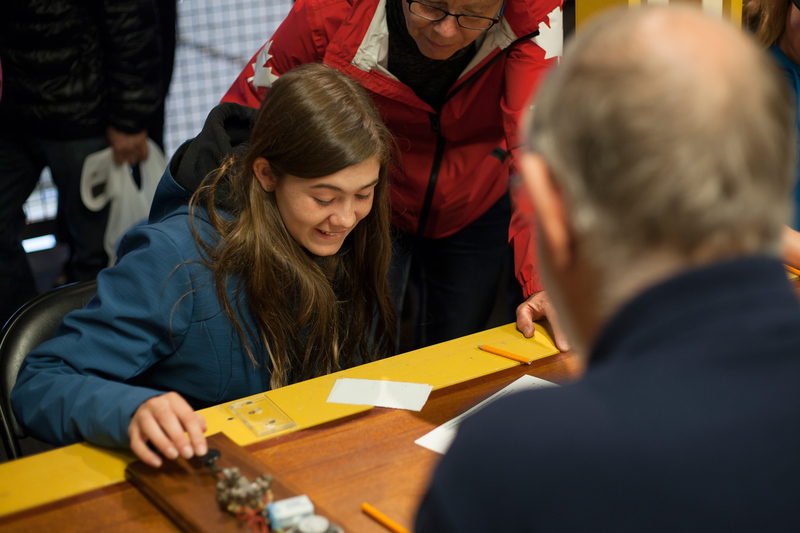 At the Maritime Museum of the Atlantic, students toured the Titanic exhibit and participated in a workshop where they learned about the international naval flag system used by ships. With a telescope, they tried to read flags on model ships from across the room. "After looking through the telescope, you go through the flag cards and find what matched the boat's flags. One of the flags meant, 'Ship is on fire. I need immediate assistance.'" explained 14-year-old Caleb Hoffmann. "I'd rather decode the flags than put them up," he admitted. After lunch at the Citadel, the students were given some free time to explore downtown Halifax. (It was an authentic Halifax experience, since it poured rain all afternoon.) Although the rain didn't dampen their spirits, the Lethbridge students had to bid a final farewell to Nova Scotia. It's safe to say they won't be forgetting this trip any time soon!